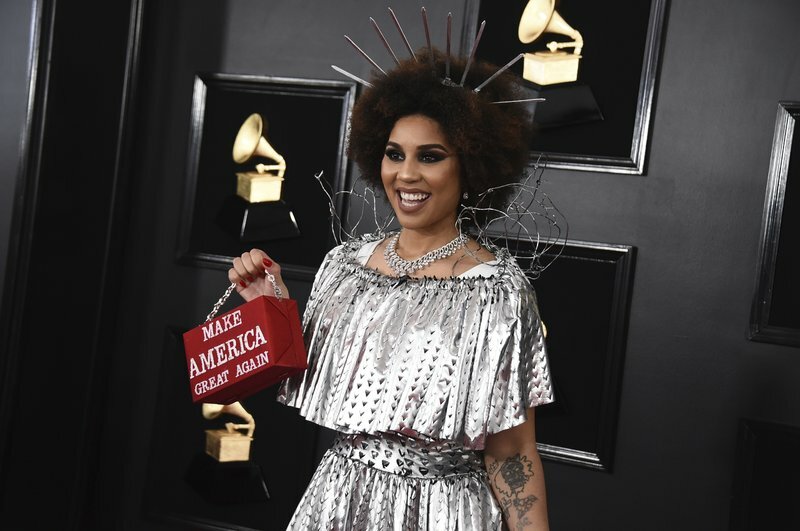 A few supporters of President Donald Trump made their fashion marks on the Grammy red carpet. Singers Joy Villa and Ricky Rebel each wore looks that made political statements Sunday night. Villa wore a white dress with the black outline of bricks and silver barbed wire tufts on her shoulders as well as carrying a purse with Trump’s “Make America Great Again” slogan. Trump has proposed a controversial border wall between the US and Mexico. Desi Designs Couture, the designer of Villa’s dress, posted a disclaimer on Instagram saying clients’ views, thoughts and opinions aren’t necessarily the same as the company’s. Rebel wore a red, white and blue jacket over white pants tucked into white boots. The jacket read “Trump” on the back and “Keep America Great” on the front.